I decided I wanted to make a mobile for my baby girls room. 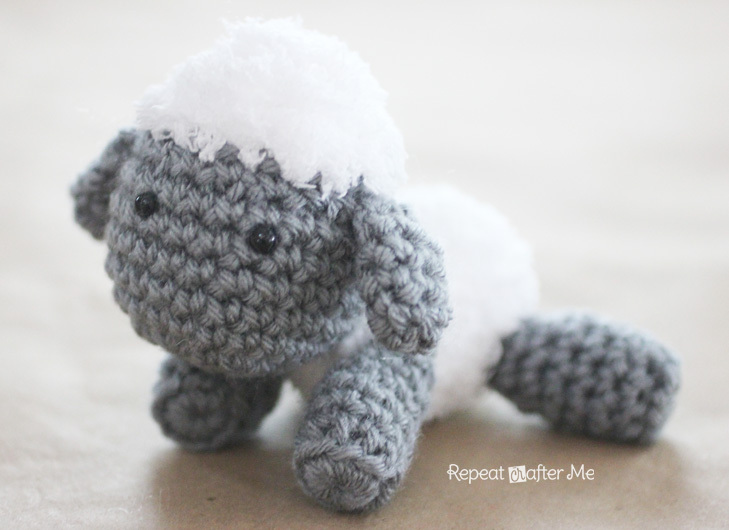 I thought some sweet little lambs would be nice and crochet was the way to go about making them. 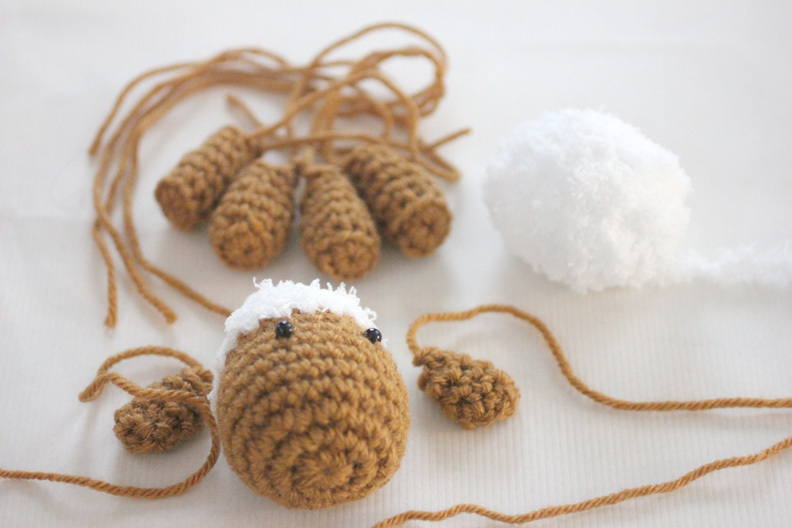 Unfortunately these little lambs took a little longer to crochet and put together than I thought they would. But if you are up for a project than this is the one for you! Of course you could always just make the lambs and leave them as little stuffed animals. They are about 5 inches long. – Worsted weight yarn in cream, brown, gray or any color of your choice. I also think a pink or blue lamb would be nice for a baby room. Round 11: SC decrease until closed. Be sure to stuff and add safety eyes before fully closing!! Chain 4, SC in second chain from hook, SC in next 2. Round 5: SC decrease or stitch closed. Sew onto head where furry yarn meets worsted yarn. NOTE: Body is worked with furry yarn. It is pretty much impossible to keep track of your stitches with this yarn. Do the best you can. If you are off by one or more stitches, that is ok. You won’t be able to see the flaws! Magic ring, chain 1, 8 SC in ring, do not join, continue to SC in rounds. Use stitch marker to mark your rounds. Leave tail to sew onto head. Magic Ring, chain 1 in ring, make 10 SC in ring, continue to SC in rounds. Stuff and sew onto body. Now lets put together the mobile! – I used the inside of an 8″ wooden embroidery hoop and painted it white. – Darice White Picket Fence (which I found at Jo-Ann Fabrics but if you google it you can purchase it online from multiple places). I had to buy two since one is too short to fit around the entire hoop. 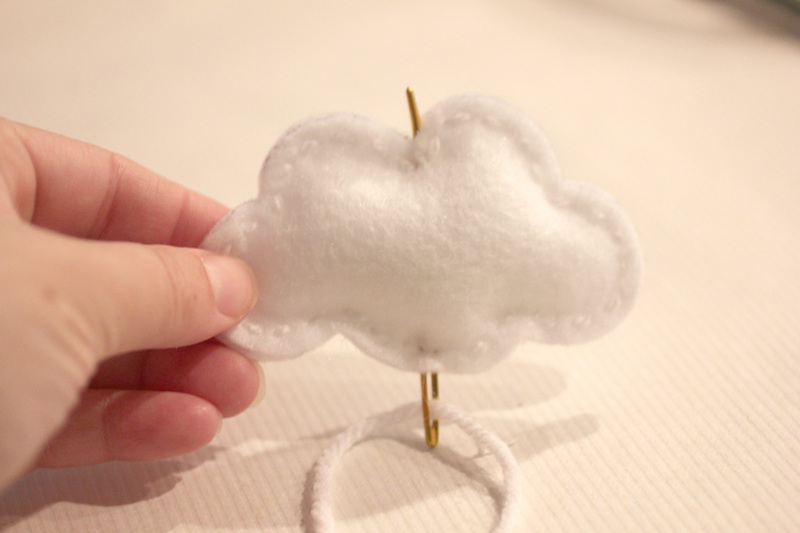 – 3 white clouds which I cut out from felt (you will need to cut 6 clouds, lightly stuffed with poly-fil and stitched around the edge with 2-ply yarn and a tapestry needle). I used THIS as my template for the clouds. 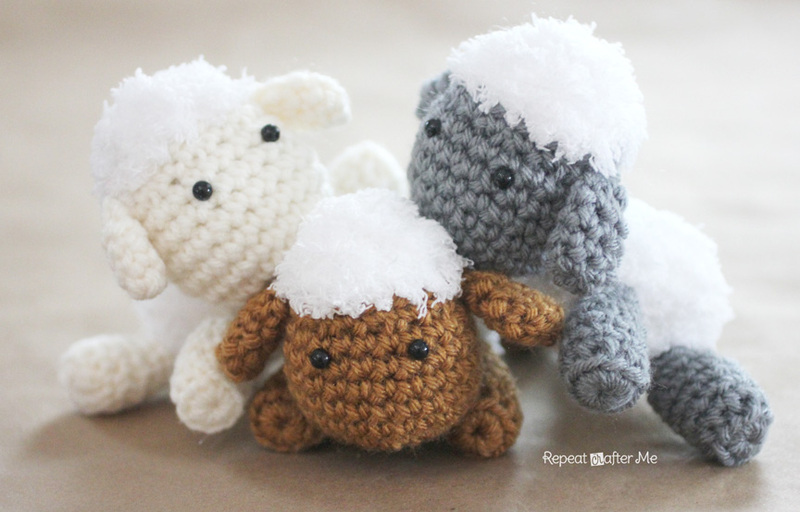 – And my crochet lambs. 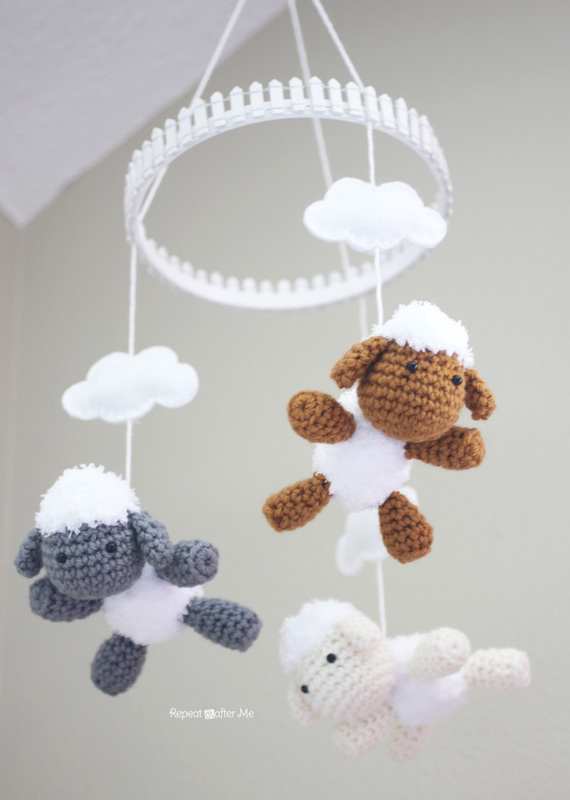 First thing you will want to do is cut a long piece of worsted weight yarn and string it through the cloud and crochet lamb. 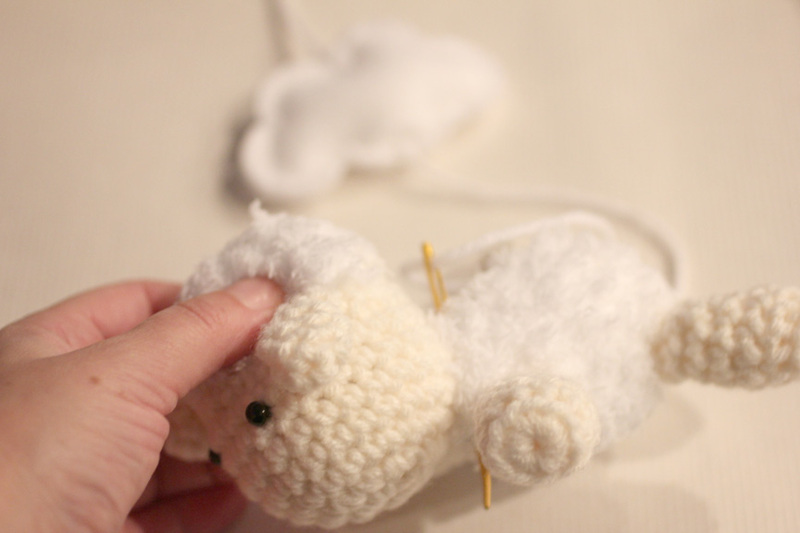 Use a tapestry needle to send the yarn up the middle of the cloud and then through the body of the lamb (near the neck). Now loop your yarn back up the bottom of the lamb and make a knot. 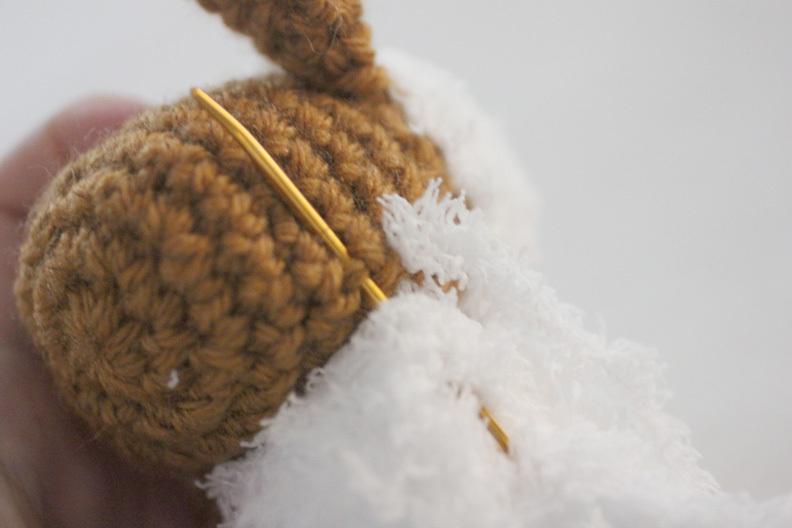 You can weave it through again to make sure it is tightly secured to the crochet lamb. Tie the yarn onto your painted embroidery hoop. Hopefully you still have a long end left that will tie together with your other two strings and attach to a hook from the ceiling. If your yarn isn’t long enough, just tie on a second string so that you will be able to hang it. You will want to repeat this entire process with all three of your lambs/clouds and place them evenly around your hoop. 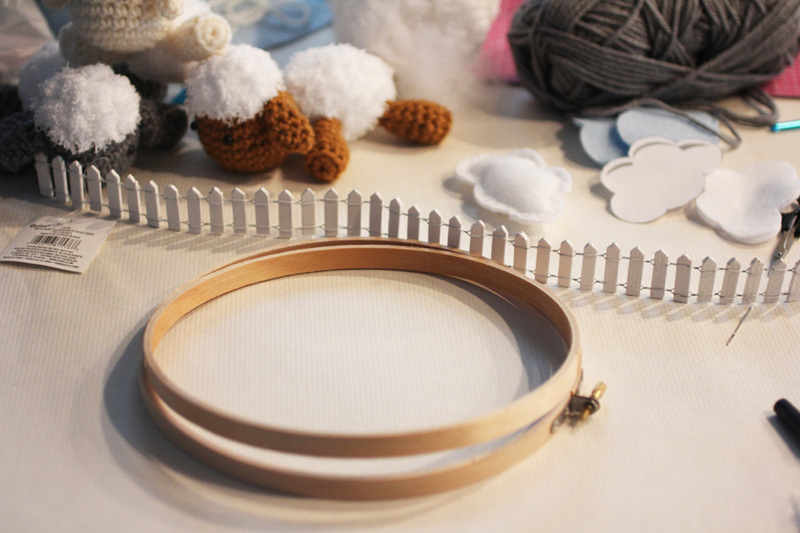 Now hot glue your white picket fence over the outer edge of the embroidery hoop and over the yarn that you have tied on. Tie the strings together and hang from a cup hook in your ceiling. Disclaimer: Please use extreme caution if placing this over a crib. Make sure all your pieces are secure. In fact, I decided to place mine in the corner of the room near the changing table. I don’t trust this craft to be a safe object to place over the baby’s crib. Wow….I just so it in Facebook ….you did a great job…the birth of my granddaugther is in September and I had crochet your Sock Monkey Hat pattern ,I made it in white and pink and came out so cute.Thanks for all you are offering and sharing with all of us.Best wishes ! This is so awesome! I don't like crocheting with fluffy yarn because I can't see my stitches but it doesn't seem to be so bad on this pattern, I can't wait to get started. Thanks for sharing your pattern! This mobile is gorgeous with the cute little lambs. Nice to give to a newborn baby and his parents. Thanks for sharing the pattern with us. These are so sweet. My 2nd baby is due this December and I was wanting to make your lamb hat for newborn pictures. I will have to make one of these little sheep stuffed animals as a welcome baby present. So cute! Thanks for sharing! Have to tell you your stuff is so cute!! Sweet lambs! I love it! This is amazing! If I had a baby, I would absolutely make this! Love this mobile and to top it off a free pattern for it! Thank you so much! So sweet!! Thank you for sharing!! I need to make two of these for the babies coming the first of the year. Adorable ! Thanks so much for the pattern ! Wow! This is adorable! Thanks for the pattern. Adorable to the 'enth' power! I'm not so sure my stiff old fingers would cooperate to crochet them… What would you think if I adapted the idea to another lovely fiber art, & worked them into felt, from dry-felting some wool roving? Oh, think of how 'floofy' the clouds might be! Really adorable! Thank you for sharing the pattern! So sweet! Thank you for the pattern! I was wondering if you can send me a link to where you purchased the small safety eyes. Oh how cute, what a great idea!, glad I saw this it was so helpful. Have you read about http://www.diybabymobile.com, another great website! Your website is beautiful and I love the design! I`ve just finished your well-written patterns für the Lamb, Newborn Baby Booties and Newborn Crochet Owl Hat. If you`re interested in the result, please have a look on the pictures on my homepage http://imanimanuo.blogspot.de/2014/05/nachgehakelt-anleitungen-repeat-crafter.html. The Website is german, I introduce your homepage and that you show over 100 sweet crochet patterns for free. If you like to have further information, what I wrote, please don`t hesitate to contact me. How many stitches do you use for the magic ring on the body? I used eight stitches on the magic ring for the head. Also how many stitches for the magic ring on the feet? FYI I think you need to make a slight change to Round 9 for the head to get 16 stitches. Thnx so much for sharing, love it! If for some reason you don’t like that, just send me an email. Hi Cute pattern but is row 7 in the body complete? It seems to stop before the end of the instruction? This just made my day! Thank you, Sarah! Just found this pattern. So darling! My mom’s main complaint about baby mobiles is that they only look cute for the other people in the room because all the baby sees lying in the crib is the bottom of whatever object is hanging above them. I usually make butterfly mobiles for this reason. This one is also perfect because the baby gets to see the cute, soft faces looking back at them! Thank you for sharing! Das Mobile ist toll. Würde es gern nacharbeiten, habt ihr die Anleitung auch auf deutsch ? 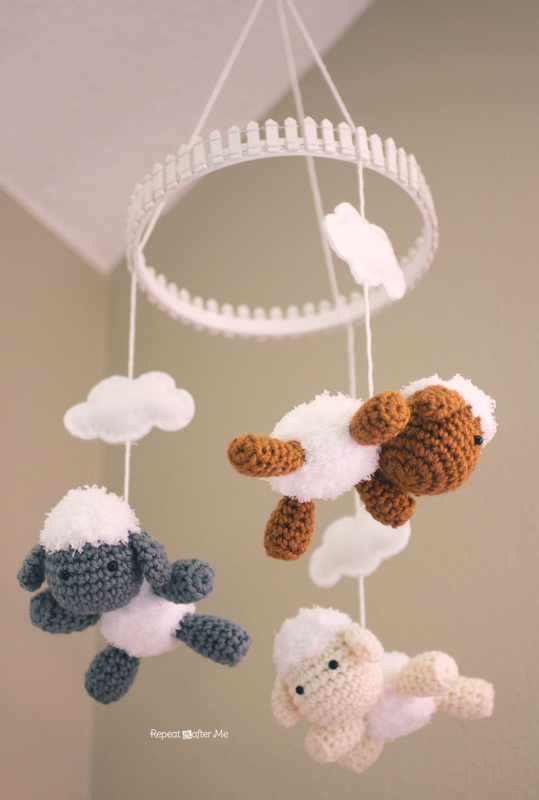 I keep featuring you on my pattern roundups, I can’t help it, I love all of your patterns 🙂 I’m expecting my first child this summer and was excited to find this adorable mobile, thank you so much for sharing. Does any know how to cut the fencing? One length doesn’t go around (as Sarah pointed out), so I got 2, but the posts seems to be connected by continuous wires. Thanks. Instead of using embroidery hoop & (toy fencing), you could have used a loom knit hoop. How much of the furry yarn do you require for the three sheep?